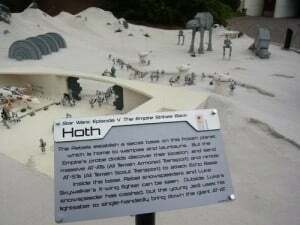 Star Wars Miniland is the newest addition to my favorite section of Legoland California in Carlsbad. Miniland is simply mind-boggling to the LEGO-lover in me. I once saw a Brick Master discuss the challenge of making round shapes out of square and rectangular bricks. I’ve never looked at LEGOs the same way. 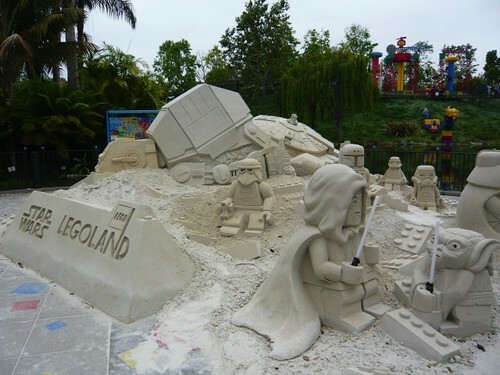 Read Trekaroo member reviews of LEGOLAND. I heard from mom friends that the Star Wars Miniland was awesome. I also heard that it took the place of the Nascar racetrack that my kids loved. I expected to see a Star Wars scene occupying the same small parcel that held the racetrack. Boy, was I wrong! There were actually SEVEN separate new display areas grouped together with each area representing planets like: Hoth, Tatooine,Geonosis, Naboo, Endor, etc. 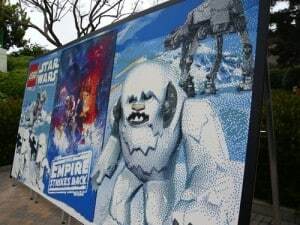 Within each display, Star Wars fans will recognize different scenes and details from the episodes. It was fun to see and even entertaining to photograph. If your family is into Star Wars, then it demands a visit. Need a place to stay? Read reviews of kid friendly hotels in Carlsbad. LEGO Star Wars Days (June 18-19th) – We’ve attended this event in years past and it really is worth the trip. I still have photos of my little guy with a bunch of clone troopers, Jedis, storm troopers, and Darth Vader from 2008. DUPLO Splash Safari and Kid Creek, features interactive spray pads, fountains, a teeter totter and interactive DUPLO animals geared specifically for guests ages 1 to 3. It’s a great addition to the 5.5. acre family water park. 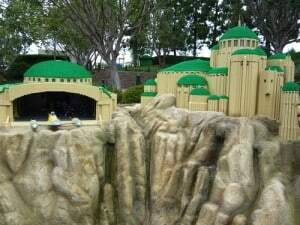 Read reviews of the LEGOLAND Water Park. Octopus Garden at SEA LIFE Aquarium – An interactive exhibit introducing families to the amazing world of cephalopods featuring their almost supernatural abilities including camouflage, ink clouds and jet propulsion to surprise and delight adults and children alike. Read reviews of SEA LIFE Aquarium. Fun Town Police and Fire Academy – Regulars will recognize this classic LEGOLAND ride where families pile into a fire truck and power it by pumping levers up and down as they race other families to put out the “fire.” Now there are police cars in the mix and two separate entrances with trucks racing on both sides of the wall. Even if you don’t ride it’s extremely entertaining watch. Hero Factory – Located inside the I-Zone. In this next generation LEGO story, heroes are designed, equipped and built depending on specific missions that beam in from across the galaxy and across time. They are dispatched in hero pods to defeat evil and take on a variety of missions. My insider advice would be to arrive early and start at Star Wars Miniland before it gets busy! Michele Whiteaker blogs at FunOrangeCountyParks.com where she promotes play and encourages family outdoor activity. She’s also a 2011 Superoo who’s taken to putting “-roo” at the end of anything travel-related.